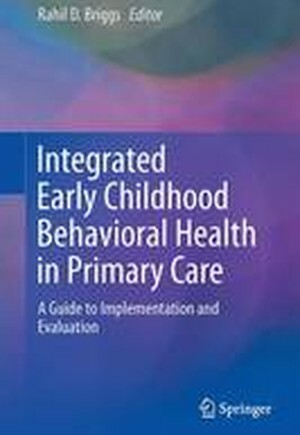 This book provides a step-by-step guide to integrating early childhood behavioral health care into primary care with hands-on advice for creating, implementing, and evaluating programs. It discusses the unique advantages of pediatric primary care as a setting for mental health services from birth into the early school years, particularly for addressing parent/child stress and trauma issues. Contributors illustrate in depth how bringing behavioral health into pediatric services can engender care that is replicable and sustainable, not only cost-effective but also clinically effective. Guidelines and case examples from frontline practitioners highlight typical challenges and workable recommendations. Among the featured topics: * The fit between early intervention programs and primary care. * Staffing, workforce development, and funding issues. * On-the-job teamwork concerns, from time constraints to continuity of care. * Culturally competent care geared toward key child care issues. * Intervening with parents of young children in the integrated pediatric setting. Integrated Early Childhood Behavioral Health in Primary Care is an essential resource for clinicians/practitioners, graduate students, and researchers in child and school psychology, pediatrics, and social work. Foreword; Jack P. Shonkoff.- Chapter 1: Introduction; Rahil D. Briggs.- Chapter 2: The Clinical Adverse Childhood Experiences (ACEs) Questionnaire: Implications for Trauma-Informed Behavioral Health Care; Anne Murphy, Howard Steele, Miriam Steele, Brooke Allman, Theodore Kastner, Shanta Rishi Dube.- Chapter 3: The Economics of Child Development; Andrew D. Racine.- Chapter 4: The Goodness of Fit between Evidence Based Early Childhood Mental Health Programs and the Primary Care Setting; Dana E. Crawford and Rahil D. Briggs.- Chapter 5: Healthy Steps for Young Children: Integrating Behavioral Health into Primary Care for Young Children and their Families; Margot Kaplan-Sanoff and Rahil D. Briggs.- Chapter 6: Workforce Development for Integrated Early Childhood Behavioral Health; Rebecca Schrag Hershberg and Rahil D. Briggs.- Chapter 7: Healthy Steps at Montefiore: Our Journey from Start Up to Scale; Rahil Briggs, Rebecca Schrag Hershberg, Miguelina German.- Chapter 8: Cultural Considerations in Integrated Early Childhood Behavioral Health; Helena Duch, Kate Cuno, Miguelina German.- Chapter 9: Funding, Financing, and Investing in Integrated Early Childhood Mental Health Services in Primary Care Settings; Ayelet Talmi, Melissa Buchholz, Emily Muther.- Chapter 10: Considerations for Planning and Conducting an Evaluation; Ellen Johnson Silver and Rosy Chhabra.- Chapter 11: Integrating Early Childhood Behavioral Health into Primary Care: The Pediatrician's Perspective; Diane Bloomfield, Nicole Brown, Karen Warman.- Chapter 12: Stories from the Exam Room: Case Examples of Healthy Steps Interventions at Montefiore; Laura Krug and Polina Umylny.- Appendix.